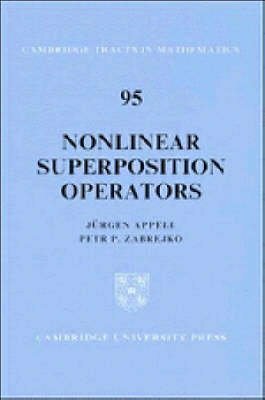 This book is a self-contained account of knowledge of the theory of nonlinear superposition operators: a generalization of the notion of functions. The theory developed here is applicable to operators in a wide variety of function spaces, and it is here that the modern theory diverges from classical nonlinear analysis. The purpose of this book is to collect the basic facts about the superposition operator, to present the main ideas which are useful in studying its properties and to provide a comparison of its behaviour in different function spaces. Some applications are also considered, for example to control theory and optimization. Much of the work here has only appeared before in research literature, which itself is catalogued in detail here.